Gross Area: 153,000 sq. ft.
Area Per Student: 337 sq. 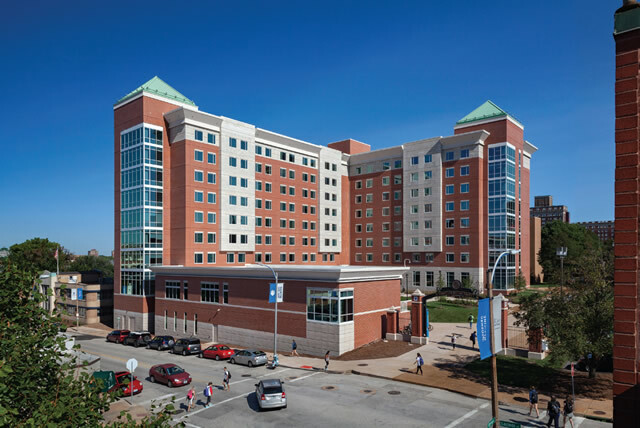 ft.
Saint Louis University (SLU) engaged Hastings+Chivetta to design two new student-housing facilities—the 454-bed, eight-story Spring Hall and the recently completed 528-bed Grand Hall. Spring Hall is designed for first- and second-year students, and houses two Learning Communities—the Leadership for Social Change Learning Community and the Honors Learning Community. A range of amenities support a collaborative student lifestyle, with a focus on integrating academics and student life. A chapel, community kitchen and community living room encourage students to share their spiritual and cultural traditions. Sun-filled lounges and study rooms are located on each floor, most with expansive views of the surrounding city. Student organizations make use of conference rooms and classrooms equipped with teleconferencing technology. Students wishing to practice an instrument can use one of two acoustically isolated music practice rooms. An office suite on the first floor serves Spring Hall staff as well as the campus minister. Nearby are flexible hoteling suites for faculty who use the facility’s classrooms. The exterior building materials were designed to harmonize with SLU’s historic context. The façade incorporates brick with cast stone that mimics the limestone prevalent on campus. A large outdoor courtyard creates a central gathering space for students, and includes a “front porch” with a pergola, fire pits and integrated benches. Also included is a large outdoor television and sound system surrounded by tiered seating that can be used for both classes and resident movie nights. 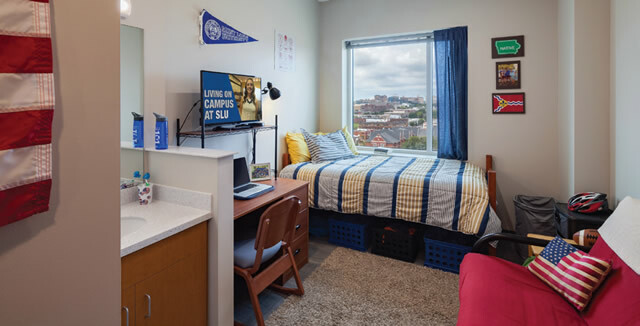 The design of Spring Hall supports SLU’s goal of encouraging a lifestyle that integrates academics with daily living through Learning Communities. The Leadership for Social Change Learning Community and the Honors Learning Community are both sponsored in Spring Hall. Students who commit to a Learning Community typically live on the same floor with one another and frequently share similar class schedules. Extracurricular activities for each Learning Community occur in lounges located on every floor, and classes and meetings are held in the shared conference rooms and classrooms on the first floor. A hoteling office suite on the first floor provides temporary office space for faculty using Spring Hall’s classrooms. Faculty is provided office space with power and data hookups, Wi-Fi and comfortable furniture within the shared suite. This gives faculty from different disciplines the chance to interact with each other. The in-building suite means faculty remain in the building longer, increasing the chances of both planned and impromptu interaction with students. Spring Hall also supports music majors and students who play an instrument independently or with a University-sponsored group. Two music practice rooms are located on the first floor near other shared building amenities. Each room is acoustically isolated with sound-absorbing materials and angled walls that minimize reverberation. The building is designed specifically to support first- and second-year students who are beginning to find and form their social circles that, in many cases, will last a lifetime. 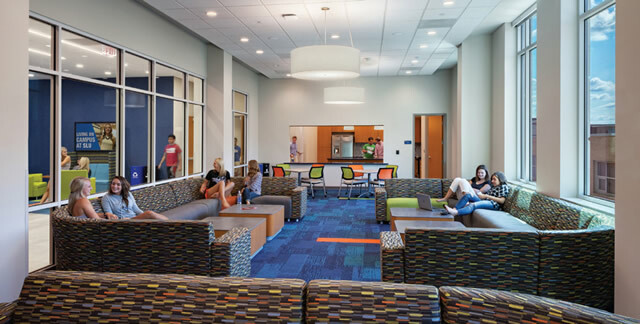 The architecture and interior design of Spring Hall provides opportunities for students to meet and interact with many others on a daily basis in lounges and study rooms throughout the facility. The primary hub of activity is the shared kitchen and “living room” on the first floor. In addition to a long wall of windows facing the outdoors, the space features a second window wall with views to the main building entry and lobby. The lounge is also open to the adjacent shared kitchen. Students can cook and eat together, or just hang out and watch a movie. SLU is a Catholic institution, and as such the spiritual growth of its students is equally as important to the University as their academic achievement. The Spring Hall chapel is the first dedicated residence hall chapel to be built on campus. Mass is held each week on Tuesday evenings at 9:00 pm to accommodate the busy schedules of students. As part of the University’s commitment to diversity and inclusion, Wudu stations are included in Spring Hall near the chapel. Muslim Wudu is the practice of washing and cleansing in preparation for prayer. In addition, gender-neutral restrooms are located on the first floor nearby the traditional men’s and women’s rooms. The furniture selections were tailored to each space to support a range of small- and large-group activities. 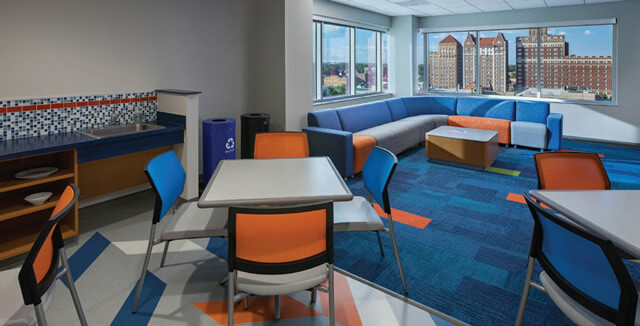 Small study rooms are positioned in the “corners” of each floor giving students access to daylight and views of the city. Each study room has both comfortable lounge chairs for solo studying and mobile tables and chairs for small groups. Comfortable sectional couches with ottomans, located in the lounges on each floor and in the main first-floor lounge, can be easily reconfigured. Classrooms and conference rooms offer a range of mobile furniture to allow the rooms to be reconfigured as needed for a variety of group activities and teaching styles. As an eight-story mixed-use residence hall/classroom facility, Spring Hall is designed to support seamless technology integration. Wi-Fi is available throughout the facility. Flat-screen televisions with computer connectivity are located in all gathering spaces, including lounges, study rooms, conference rooms, classrooms, the laundry room and the kitchen. Classrooms and conference rooms are equipped with audio and visual technology allowing presentations and in-class discussions to be shared remotely in real-time. 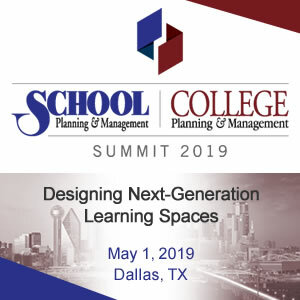 Each conference room and classroom uses a touchscreen scheduling system that lets students immediately see the room-use schedule and reserve the rooms themselves for future use. Spring Hall is located in the vibrant St. Louis City neighborhood of Grand Center. It is a very appealing setting for a new residence hall because of the active cultural district that features theaters, clubs, and galleries, as well as a host of restaurants and bars, all within walking distance of Spring Hall. Providing a safe residential environment in the heart of the city without a heavy-handed feel was a priority for the University. Spring Hall offers 24/7 access, with a 500-door access-card control system, including the main entry and each dorm room. All visitors must be checked in at the entry desk, which is staffed 24/7 and the entire facility is monitored by an integrated camera system. Given the large scale of the building and the similar layout of each floor, Hastings+Chivetta’s designers integrated wayfinding cues into the interior design to give residents simple ways of identifying their location and finding their destination. For example, the elevator vestibules on each level feature alternating wall colors—lime green on odd-numbered floors and SLU blue on even-numbered floors. In addition, designers created “stoops” from brightly colored carpet tile at the entry to all stairwells and elevators. The courtyard of the “U” shaped building offered an ideal location to create a welcoming outdoor space for students, which is a major contributor to the success of Spring Hall. The courtyard features a “front porch” that welcomes students with two fire pits surrounded by bench seating on both sides. A pergola over the “porch” diffuses sunlight during the day and helps to define the space and give it a cozy feel. The outdoor classroom is the highlight of the courtyard. Configured like a small amphitheater, an outdoor television with integrated sound system is surrounded by ADA-accessible tiered seating. The space is large enough for faculty to hold classes, with the option to connect their laptops to the TV and audio system. Similarly, students are using the space for both movie nights and video game nights. The large green lawn is an oasis in the surrounding urban setting and gives students an unstructured, park-like space to hang out. A curving walkway with perpendicular paver elements connects the front door of Spring Hall to the campus pedestrian system and provides visual interest to the space by creating a stair-like effect. Designers were required by code to add a rainwater detention system to the site—in this case a bioswale. When fully grown-in, it will not only filter the rainwater on the site but it will also create a landscape buffer to reinforce the feeling of the courtyard as a natural oasis in the city. Exterior space is agreeably designed. The interior and exterior hang well together, spaces are flexible. A nice project.